Farming in the monsoon season in Nepal. Credit: Mallika Aryal/IPS. KATHMANDU, Apr 1 2014 (IPS) - Water is a critical resource in Nepal’s economic development as agriculture, industry, household use and even power generation depends on it. The good news is that the Himalayan nation has plenty of water. The bad news – water abundance is seasonal, related to the monsoon months from June to September. Nepal’s hydrologists, water experts, meteorologists and climate scientists all call for better management of water. But a vital element of water management – quality scientific data – is still missing. Shib Nandan Shah of the Ministry of Agricultural Development agrees that accurate and timely data, especially rainfall data, is important to rural farming communities. Thirty-five percent of Nepal’s GDP and more than 74 percent of its 27 million people are dependent on agriculture. And most of Nepal’s agriculture is rain fed. “Reliable data is especially important for a farmer who wants to insure his crops,” says Shah. 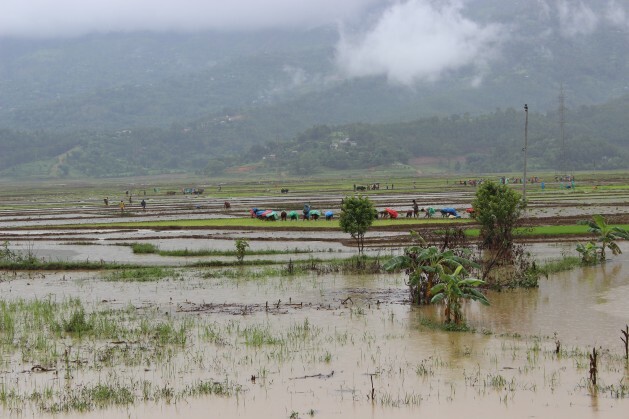 “If the information is lacking or if it is inaccurate, how is a poor farmer supposed to protect himself?” Every year, floods and landslides cause 300 deaths in Nepal on average, and economic losses are estimated to exceed over 10 million dollars. Data becomes important in a country like Nepal that has large, unutilised water resources. At the local level, development work becomes harder, and there’s a risk that development is being based on “guesstimates”. “Simulations without data to verify against are meaningless,” Vladimir Smakhtin, theme leader at IWMI, tells IPS from Sri Lanka. Experts also argue that water data cannot be studied in isolation. “Data on rainfall, water resources, weather are all interlinked with hydro power development, road building and also aviation,” says Rishi Ram Sharma, director of Nepal’s Department of Hydrology and Meteorology (DHM). One of the biggest challenges in Nepal, and the reason why collecting information is so difficult, is the country’s inaccessible terrain. About 86 percent of the land area is covered by hills, and steep, rugged mountains. Scientists believe it will take many years to establish better networks of measuring stations. Experts recommend the use of new technology such as remote sensing which can be used to measure evapo-transpiration, soil moisture and land use. One of the most important reasons why scientists and Nepali policymakers need water and weather related statistics is to understand climate change. “First of all we don’t have enough data, and what we do have is not analysed properly, which means a lot of climate change prediction relating to disappearing snow, glacial melt, water scarcity becomes misleading,” argues IWMI’s Bharati. In one recent measure to address this problem, Nepal’s DHM introduced the climate data portal in 2012 where data relating to weather, water and geography is stored. Real-time information regarding flooding, water levels, precipitation is available through DHM’s website. IWMI is also working on a portal to bring together data, including basic information on land use, census and migration, in order to aid researchers. Anil Pokhrel, Kathmandu-based disaster risk management specialist with the World Bank agrees that making data public is a big and important step. This means that whoever is looking for information has access to it and can download it. Pokhrel says data on water, climate change, weather and agriculture is so interlinked that it really needs to be open. For this he recommends that the portal be open source. “At the end of the day, there’s no other option – we have to make portals to consolidate data and make it accessible and user-friendly,” says Pokhrel. i wonder if there is a website/one location where all actors working on water in Nepal are listed and their data can be referenced? with issues you skillfully point to here, and many claimants on the same resource, a cross-sectoral collaboration becomes ever so crucial.